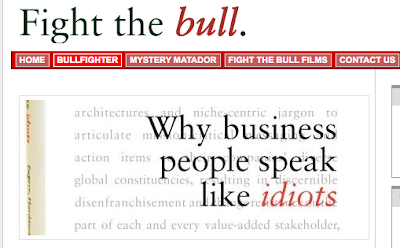 Fight the Bull is a website dedicated to eliminating business jargon. Some nice stuff here. You can even download a toolbar that will scan your document and take out all the bull. With the Bull Composite Index, you can see how jargon-filled your Word doc or Powerpoint slides are. The bit I like best is their Mystery Matador. If you get an email from a colleague that is full of bull - you can paste it into the Matador and anonymously send your colleague's email back to them from this site, with a score on how much bull was in their original email. Man, if I didn't have a complete aversion to "handy" toolbar installations I might give this one a go! None of my stuff would be printable ;) probably.